The cuisine of Malaga is light, healthy and typically mediterranean: Shrimps in all variations, roasted or boiled, and Pescaito Frito, fried fish, are among the major attractions. A regional speciality are Chanquetes, very small fishes of the family of anchovies. Boquerones in Vinagre are other small fishes which are put into marinade for a day or so, a delicious and very refreshing dish. In the mountain-ranges close to Malaga, on the other hand, you'll find dishes of game, sausages and the famous "Rabo de Toro a la Rondeña", bull's tail prepared in the style of the small town Ronda . Vegetarians appreciate the fresh and mature vegetables of the region. But Malaga's perhaps most famous recipe is another variation of those cold soups or Gazpachos, which are that typical for all Andalusia: Ajo Blanco is a fine cream of almonds, garlic and olive-oil. The sweets mostly show Moorish influence and are frequently prepared of almonds and honey. Among the best known are those very popular Christmas-cakes, Alfajores and Polvorones, and a regional speciality with a quite promising name: "Bienmesabe" means simply that tastes good. From the high mountain ranges around Granada comes the perhaps best known speciality of the region, the reputated Jamón de Trevelez, a ham that is cured in the snow. 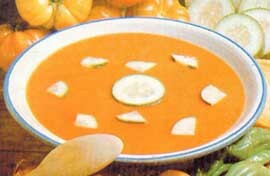 Ajo Blanco is a delicious cold soup made of almonds, original from the coast. There you have to try as well Espetones, sardines grilled at the barbecue. In the mountain range Sierra de Alpujarra are well-known Migas Alpujarreñas, made of fried pieces of bread, and Pollo con Tomate, chicken in tomato sauce. Original from the town itself are Tortilla al Sacromonte, the local version of the "spanish omelette", Habas Fritas con Jamon, fried beans with cured ham, and Pollo al Ajillo, chicken with garlic. The desserts are mostly of Moorish tradition, often made of almonds and honey, like Torta Real and Pestiños. Tocinos de Cielo, made of yolks of egg, are a speciality of the village Guadix. Well known are also the creme-filled Piononos from Santa Fe and the Roscos from Loja. Gazpacho, the famous cold "soup", a vegetable-cream made of tomato, cucumber, paprika, garlic, olive-oil, vinegar and bread; Pescaito frito, fish turned around in flour and fried in olive-oil; Huevos a la Flamenca, a fried egg in a sauce of tomato and Chorizo (a spicy typically Spanish sausage); Cocido Andaluz, a "hot-pot" made of chick-peas and different vegetables; Rabo de Toro, a ragout of bull's tail. The numberless bars of this city use to offer so-called Tapas, "mini-dishes" for the small hunger. Each local has its own "house-specialities", but some recipes you will find almost everywhere: Huevas, fish-eggs either with mayonnaise or Sauce Vinaigrette, Pinchos Morunos, very spicy spits of meat, Pavías de Pescado, marinaded fish fried in olive-oil, Caracoles, snails in a tasty sauce, Jamon, cured ham, and of course the fantastic olives of the region. The great local wines, Jerez (sherry), Manzanilla and Montilla are a perfect match to all those dishes. The traditional sweets are mostly of Moorish influences and are prepared often with honey, but also with wine. Very well known are Torrijas and Llemas de San Leandro. Olive oil, being produced in big quantities around Cordoba, is an important ingredient of many typical dishes. Gazpacho and Salmorejo, delicious and refreshing cold soups made mainly of mashed vegetables and olive oil, are the indispensable first dish during the hot season. Equally indespensable is Jamon, cured ham, which is produced in extraordinary quality specially in Valle de los Pedroches. Salchichon de Pozo Blanco, a typical sausage, Caña de Lomo and Morcilla, blood sausage, are more specialities. The typical desserts mostly show Arabian influences: Alfajores, made of almonds and honey, Pestiños, a sweet fried in oil and covered with honey, and Pastel Cordobes are the best known. Toledo's cuisine, fitting to the character of the town itself, puts you back into long gone times, and the dishes seem to be served out of one of Velazquez's still lifes. Recipes are influenced by the region's long tradition of hunting and cattle-breeding, but show Moorish influences as well. Quails are some of the most extraordinary pleasures for delicate palates. They are usually served either stuffed, Perdiz Estofado, or together with a particular kind of beans, Perdiz con Pochas. Very typical are as well lamb, fried or boiled, Cordero Asado or Cuchifrito, and the potato-omelette Tortilla a la Magra. But there are two products in particular that have made Toledo's cuisine internationally famous: Queso Manchego, a very mature cheese often made of ewe's milk, and marzipan which is produced here in extraordinary quality and exported into many countries. The wines of the region, D.O.C. La Mancha or Mentrida, are of high reputation as well. Sun and oranges, delicious seafood, vegetables and very good wines D.O. Utiel-Requena and Valencia ... those are catchwords characterising one of the finest cuisines of Spain. Also rice which is produced here in large quantities is a protagonist in many typical dishes. The Valencianos understood to combine those ingredients to perfect masterpieces, Paella Valenciana being the most famous example. There are many variations of this recipe, and even experts cannot determine which one is the original Paella. Bst known is what Valencianos call Paella Marinera: rice with saffron, sea-food and vegetables. Often is added chicken to it (Paella Mixta). The Paella which Valencianos use to call Valenciana is all different: it consists of chicken and snails (plus the base of course, saffron-rice and vegetables). By the way, a really good Paella you cannot make at an electric range, but on charcoal-fire in a flat pan of impressive diameter, called Paellera. After all the ingredients have been added you cannot stir it around anymore. Only artists of cuisine neither burn the dish nor serve it crude - but then results are overwhelming. 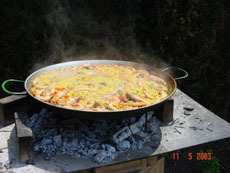 Fideuá is similar to Paella, but the rice is replaced by a particular kind of noodles. Another speciality is Arroz Negre, "Black Rice", which debts its color to the ink of cuttlefish. If you need a refreshment somewhen, try a drink called Horchata. It is made of the milk of a plant called Chufas (somewhat similar to rice) and is served ice cold. Since Philip II made Madrid the capital of Spain, numerous recipes and influences from all the regions of the country entered in its kitchen. Today it is practically impossible to say which dishes are original, and which are imported. Today Madrid offers more a Spanish than a regional kitchen. 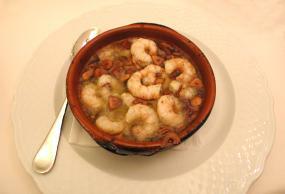 The dishes that are called madrileño in Spain, are mainly hotpots, as the well-known Cocido Madrileño with chick-peas. Among regional specialities have to be named the delicious asparagus from Aranjuez and the very typical Sopa de Ajo, a soup of garlic. There are many dishes of lamb and veal, but - perhaps a bit surprising considering its geographic location - Madrid is a real paradise for the lovers of any kind of fish. It has the second biggest fish market in the world (behind Tokyo), and as well in shops as in many Restaurants you will find an ample selection and extraordinary quality. Ideally fitting to such a meal are the young and aromatic wines from the region, Vinos de Madrid. To finish your dinner in a very typical way, try a cup of Anisado de Chinchón, anisette schnapps. Traditional sweets are the Roscos de Santo, which are made specially for for the Festival of San Isidro. Cochinillo al Fuego, roasted porkling, Chafaina, rice with meat and "Chorizo"-sausage, meat pies like Hornazo andChichas are among the best known recipes. Among sweets Chochos, with anisette, are outstanding. Several typical products of the province are appreciated for their high quality: Cured ham from Guijuelo, cheese from Hinojosa del Duero, Alubias, a delicious kind of beans, from La Alberca and almonds, the so-called Almendras de Santa Teresa, from Alba de Tormes. Roasted goat meat from the mountain range Sierra de Francia is considered a speciality, as Calderillo bejarano, a ragout of meat and potatoes, from Sierra de Bejar. In Ciudad Rodrigo they make a delicious sausage of almost white colour, called Farinato. Some of the best known regional specialities are: Bacalao al Ajoarriero, cod-fish with garlic and eggs, Huevos al Salmorejo, eggs with a sauce of asparagus, Longaniza de Fuentes", a highly appreciated kind of sausage, Ternasco Asado, roasted veal, Pollo a la Chilindrón, chicken in a sauce of cured ham, tomatoes, onions and paprika, Cordero a la Pastora, "Lamb Sheppard's style", Lomo de Cerdo a la Zaragozana, cutlett, and Recao, made of beans, potatoes and rice. The excellent wines of the region, Cariñena, Borja, Paniza, Lecera and Valle de Jalón, are a perfect company to the recipes mentioned above. Traditional sweets are Turrones, Roscones and Mostillo. Among the best-known recipes of Barcelona there are stews, as La escudella i carn d'olla, made of vegetables, rice, noodles and potatoes, Cocido con judias blancas, of Butifarra (a typical regional sausage), Pilota (a preparation of beef), bread, eggs and white beans, Faves a la catalana, Botifarra amb monjetes and Arroz a la cazuela, a dish similar to the famous "Paella Valenciana". Typical desserts are Crema Catalana, Mel i mato (of curds and honey), and the Postre del Musico ("dessert of the musician") with pine-kernels and raisins. Specially remarkable among the wines of Catalunya are the red wines from Peralda, Alella, Priorat and Tarragona, white wines from Penedés and of course the famous Cava (sparkling wine). To speak of the cuisine of Pamplona means to speak, in a wider sense, of the cuisine of all Navarra, which has an excellent reputation and is extremely varied thanks to the characteristics of its landscapes. Specialities from the mountain-ranges are several preparations of game, usually in tasty sauces, as well as salmon and trout. An original recipe is trout filled with cured ham. 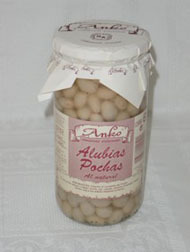 Also Pochas de Sangúesa, a very delicious kind of beans of high reputation, are the base of many typical dishes. The region of Tierra de Estela is famous for its dishes of lamb and goat: Asados de Cordero, Cabrito and Cordero en Chilindrón. Ribera has delicious vegetables, like the mild Pimientos del Piquillo (red pepper) and Asparagus, as well as an original preparation of fish in a sauce of garlic and paprika, called Ajoarriero. Combining ideally with the dishes mentioned above are the well-known wines of the region, D.O. Navarra. But the cuisine of this town has high reputation also for a variety of other recipes: Roasted lamb, chopped pork, blood pudding, red beans (called Ibeas) and hotpot. There are excellent fish-dishes as well: river crab salad and codfish á la Burgalesa are specialities of this region. To speak about the cuisine of Santiago is not possible without taking into consideration the cuisine of the entire region of Galicia, which has an outstanding reputation in all Spain. Most typical is fish, which exists here in extraordinary quality. The Saint Jacob's Shell, Viera, is not only the symbol of the town, but also a first rate speciality. The same has to be said about Pulpo á la Gallega, cuttlefish prepared with paprika. Another well-known dish is Empanada Gallega, a pie of fish, meat or vegetables. Among sweets Tarta Compostelana, a tart of almonds, is most famous. The wines of the region have a great reputation too, specially Ribeiro, young and fresh, but don't leave out the chance to try as well Fefiñanes, Betanzos, Rosal, Valdeorras, Ulla and Amandi. The cuisine of Balearic Islands, of course of Mediterranean tradition, has gained a great reputation in all Spain. It is extraordinarly varied - more than 600 different recipes are considered typical "Balearic". The internationally best known recipe is ... mayonnaise - although out of Spain there is hardly somebody today who knows that it orignally came from Menorca. 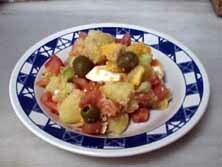 In Spanish language it is called Salsa Mahónesa, and it was prepared for the first time in Mahón. The typical sausages are well-known in all Spain, above all the Sobrasada Mallorquina, a very spicy sort of spread of red color. In its fat you may fry other ingredients. In the case of lamb, results are called Cordero asado al estilo de Mahón, in the case of eggs Huevos fritos al estilo de Soller. 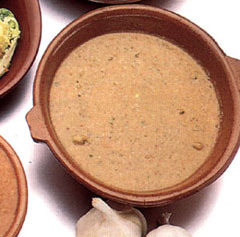 Typical of Mallorca is a variety of clear soups with noodles, fish or meat, and vegetable sauces. Tumbet is made of sliced potatoes and egg-plants covered with tomato sauce and peppers. Egg-plant stuffed with fish or meat are other common recipes. If you like seafood, you shouldn't miss the Cigala Mallorquina, a species which exists only here. Rostit is pork made in the oven with liver, eggs, bread and apples. More specialities are Pollo relleno de Granada, chicken stuffed with pomegranates, Pechuga de Pavo con Salsa de Almendras, turkey in almond sauce, and Pichones en Salsa de Castañas, pigeon in chestnut sauce. The sweet Ensaimadas are well known in all the Spanish speaking world. In Menorca you will try fish and seafood at their best: Caldereta de Langosta, seafood with peppers, onions, tomato, garlic and herb-flavored liqueur, or Arroz con Langosta, seafood and rice. Another speciality is Perdiz Menorquina, partridge prepared in the island's typical style. Ibiza has exceptional fish recipes as well: Burrida de Ratjada, ray with almonds, Langosta Ibicenca, or Guisat de Marisc, a delicious "hotpot" of fish and seafood. Coques, small quadratic tartlets with fish, meat or vegetables you will find on all the islands. Wine is produced only in Mallorca, as well as several liqueurs. A speciality of Ibiza is its herb-flavored liqueur - certainly not a bad way to finish an opulent meal. The cuisine of Canary Islands combines traditional Spanish recipes with african and latin-american influences. We find here an incredible variety of recipes, not at least for the great offer of nature, with excellent fish, fruits and vegetables. A very simple and well-known recipe is Papas Arrugadas, potatoes boilt in salt-water without peeling them and served with Mojo, a hot sauce of oil, garlic, chili-peppers and paprika. Each chef de cuisine keeps in secret jalously the detailed recipe of his Mojo. Those sauces are indispensable components of many other typical dishes as well, for instance of the famous Mojo Cochino, a ragout of pork. Among vegetarian dishes Potaje de Berros, a hot-pot of chick-peas, is perhaps best known. Gofio is a sort of bread, prepared after a very old Guanche recipe. It is typically served with Morcillas Dulces, "sweet blood sausage" which is prepared with grapes, raisins and almonds. Several of the islands have a typical cheese-speciality of their own, best known are the smoked cheese of La Palma and Flor de Guía of Gran Canaria. Among the islands' wines you should try the Malvasía from Lanzarote and the red-wines of Hierro, La Palma and Taraconte in Tenerife. Another of the islands' alcoholic specialities is Honey-Rum.